With the IBC Exhibition opening tomorrow, it’s time to finalise your game plan, take a note of stand numbers and book appointments. Chris Collings and I will be at the show and would be delighted to see you at any of our suppliers’ stands for a chat or a demonstration. We’ll be pleased to hear from you while you’re there, so please feel free to call us. My mobile number is +44 7788 995747 and Chris’s is +44 7836 324509. Last week’s Touch! included the IBC offerings from Bel Digital, Junger Audio, JLCooper and Stagetec. If there is one thing that’s got us jumping up and down with excitement it’s the IBC launch of the DirectOut ANNA-LISA software. ANNA-LISA is a handheld MADI signal analyser and generator that has a simple traffic light display for onboard reporting of sample rate, channel format, electrical level, eye pattern and MADI spec conformity. What’s making us smile is the additional and more in depth analysis that is available as an app for Android devices. Functions include measurement display of the MADI inputs, logging of status/signal changes, configuration of the MADI outputs with electrical level adjustment, a BitScope and a fibre module readout. There’s also a level meter display for the input channels and channel based routing. It may not be the final, final version but it will deliver an awful lot of what MADI users have been waiting for. And never fear iOS and Windows users, the software app will be available for you too in the not too distant future. Other MADI products on the stand will be the MI6, a 16 channel MADI monitor mixer, MONTONE.42 MADI to Ravenna audio-over-IP bridge and the MADI.BRIDGE together with the ever popular ANDIAMO and EXBOX converter series and MA2CHBOX.XL reference class headphone and speaker monitor controller for MADI and AES. There’s a lot going on in Hall 8, not least DELEC’s new Live View software for monitoring oratis and oratis compact systems. Book your demonstration today, email touch@aspen-media.com. Discover for yourself the new Unito series of audio networking interfaces on stand 8.C80. NIO 0800, 1212 and 1624 are analogue and AES3 Dante expanders and converters and the DIO is a multi-format converter. NIO 0204 is a highly flexible and adaptive networked-audio monitoring controller and pre-amp that’s small in size and amazingly large in the possibilities it offers not least for facilities, production or broadcast providers that use centralised computing or processing. All the DELEC Unito devices are a piece of cake to configure on a web browser and you can store, import and export configurations reducing setup time for large installations. The Salzbrenner POLARIS evolution has been updated since its appearance on the Aspen Media stand at BVE, to include 3D Audio integration for an immersive audio experience in theatre, film and live productions. 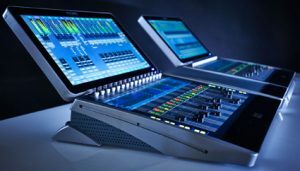 The Fraunhofer graphical user interface has been integrated into POLARIS Evolution allowing the mixer to display its own DSP channels and external equipment. 3-dimensional positioning or animation of audio objects can be undertaken in advance or during a live session. POLARIS evolution is shortlisted for two awards, the Pro Sound Award for Broadcast Team of the Year and the AV Award for Audio Product of the Year. The awards’ ceremonies are in a couple of weeks so it’s well worth coming along to stand 8.C80 to find out what all the fuss is about. We are delighted to announce that Aspen Media is the new distribution partner for Japan’s Tac System and the new VMC102 surround monitoring controller. VMC102 enables multi-stem mixing and monitoring for consoles and workstations with simple stereo (2.0) and 5.1 monitoring capability. The VMC102 is also equally at home when working in the new immersive and object audio world of Dolby Atmos and MPEG-H.